Divorce files are sealed documents and are only available to the plaintiff, defendant or attorneys of record. Identification is required to view a divorce file. You may review a divorce file that you are not a party to by obtaining a court order. To obtain a copy of your divorce decree, you should contact Customer Service at 585-753-1600 or at 39 West Main Street, Room 105, Rochester, NY 14614. Hours of operation are Monday through Friday from 9 am to 5 pm. For family court judgments, consult with that court for relevant information. Family Court can be reached at 585-371-3544. The Monroe County Clerk’s Office does not issue marriage licenses and does not keep copies of marriage licenses. Marriage licenses are issued by city and town clerks. 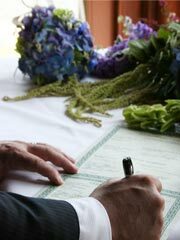 Copies of marriage licenses may be obtained from the office of the clerk who originally issued the marriage license.